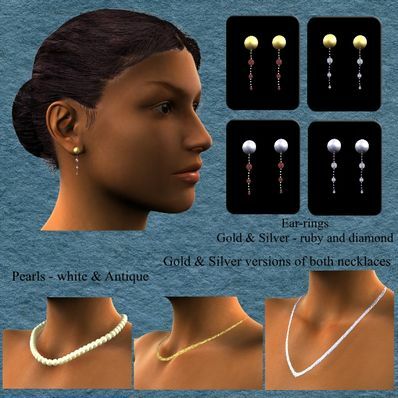 Necklaces and ear-rings for Genesis for use in Daz Studio 4. Ear-rings are parented to Genesis's head. Clean and elegant - love them. Thanks. Excellent Set of Jewellery for Genesis. Thanks! Vielen Dank für die schönen Sachen. Thanks Wendy. Very pretty jewellery. Thank you so much for the Jewelry Wilmap hun I so needed to dress up my renders!! Cool, a version of this for G2F/G2M would be great too, with simple earrings (the classic hoop). Finally, some classic jewelry. Chokers with hearts and skulls can only get one so far. Great work. These will be very useful in lots of different scenes.. Awesome.. Thanks..